Paintings on view in New York: Pour, baby, pour! Pollock dripped. Newman famously “zipped” (his narrow, vertical stripes, or “zips,” helped energize the pictorial space of his vast color-field paintings, he theorized). De Kooning pushed paint around and scraped it back off again. Fontana painted a canvas a solid color and then, daringly (? ), slashed its surface. Countless other abstract-expressionists, as modern art’s canonical story tells us, flung paint at their canvases and found diverse ways to explore its communicative potential in fits of soul-stirring, existential Sturm und Drang that forever changed our understanding of what paintings could be and how they could appear. Indeed, many an abstract painter’s efforts called as much attention to a painting’s nature as a physical object as they did to the method by which it was produced or to its real or imagined meanings. 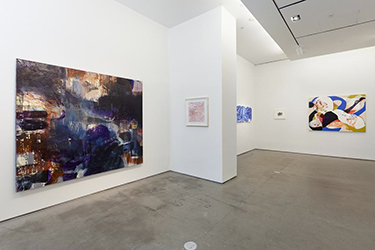 Above, left to right: Installation view of "Pour" exhibition at Asya Geisberg Gallery; Portrait, Dreamy, 2012, by Jackie Saccoccio, oil and mica on linen, 64 inches x 54 inches; and Untitled, 2011, liquid graphite on paper, approximately 5.5 inches x 7.5 inches. First photo courtesy of Asya Geisberg Gallery; next two photos of artworks courtesy of Lesley Heller Workspace. And then there were the paint pourers. Think Helen Frankenthaler, Paul Jenkins, Morris Louis... Theirs was a different kind of very fluid, accident-accepting, sometimes-controlled, sometimes-not-so-controlled, splishy-splashy way of creating paintings. Now, simultaneously, two New York galleries are presenting “Pour,” an exhibition that examines the work of a group of contemporary artists who make paintings on canvas and other support surfaces using a variety of pouring techniques. Co-curated by the artists Elisabeth Condon and Carol Prusa, one part of “Pour” is on view at Asya Geisberg Gallery in Manhattan’s Chelsea district through June 1 (537B West 23rd Street, telephone 212-675-7525). Part two is on view at Lesley Heller Workspace, on Manhattan’s Lower East Side, through May 24 (54 Orchard Street, telephone 212-410-6120). Artists whose work are featured in the two-part presentation include Ingrid Calame, Kris Chatterson, Roland Flexner, Angelina Gualdoni, Carrie Moyer, Carolanna Parlato, David Reed, Jackie Saccoccio and Carrie Yamaoka. During my recent visit to the Asya Geisberg Gallery’s portion of the exhibition, where I met up with Condon, the artist noted that the diverse selection of works on view at the show’s two venues “examines the techniques of post-World War II abstraction from the vantage of today’s digital culture.” In her own work, Condon incorporates various modes of paint-pouring, experiments with reflective materials and allusions to ancient Chinese painting’s push-me-pull-you perspectives. Like several of the works on view in “Pour,” Condon’s paintings are marked by energetic compositions that play with a viewer’s perception of pictorial space. Above, left to right: The artist Elisabeth Condon, co-curator of "Pour," with Drizzle, 2009, by Carolanna Parlato, acrylic on linen, 30 inches x 24 inches, at Asya Geisberg Gallery; Jolly Rancher, 2012, by Carrie Moyer, acrylic and graphite on canvas, 72 inches x 72 inches, at Lesley Heller Workspace; and Behind the Sun, 2012, also by Parlato, acrylic on linen, 30 inches x 24 inches, and also on view at Lesley Heller Workspace. First photo by E.M.G. ; next two photos of artworks courtesy of Lesley Heller Workspace. Works on view in “Pour” include Roland Flexner’s small (each about the size of about three playing cards), black-and-white abstractions on paper made with liquid graphite, which the artist pushes around his surface by blowing on it through a drinking straw. The resulting compositions resemble surreal landscapes or frothy cascades, and their rich tones are as vivid as the sharp gradations of grays and blacks in fine photographic prints. In works like Jolly Rancher (2012), made with acrylic and graphite on canvas, Carrie Moyer offers big, bright bon-bons marked by dynamic plays of overlapping layers of color and of shape-defining, drawn lines against the hard edges of solid, colored forms. Using oil paint and mica on linen, Jackie Saccoccio creates surfaces with a luxurious sheen; her compositions feature blob-like forms that seem to break up into nets of interwoven lines of drippy color or, conversely, thickets of drippy filaments that gather and congeal into formless forms that float on or near the top layer of a multilayered pictorial space. An enthusiastic colorist, Carolanna Parlato uses acrylic on linen or canvas—assorted pinks, lemon and pastel yellows, fiery orange, acid greens and more—in some of the exhibition’s most vivid examples of the paint-pouring method. 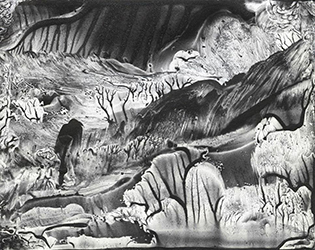 Elegant and ecstatic, her paintings seem to revel in their exploration of a very liquid paint’s shiny, viscous goo.